This addon helps to track the achievements progress. You can configure filter and mode it via option window. Open the main view per command "/achvtrack" or click on the menu item to open. Added config button to addon management. Added main view and config view to window management (Interface -> Window). Added setting to use category as negative filter. API version support changed to version 9. Remove consuming size changed events to prevent performance issues. Extended configuration that saves mode, windows size and positions, filter options, list data. Filter: Filters achievements according to the selected options. Custom List: Lists customly selected achievements. Recently Changed: Shows achievements that were updated last time. 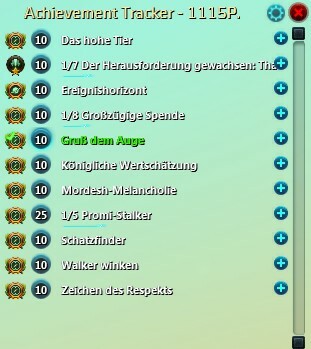 Added guild achievements. Names have the prefix "(G)". Added workaround to update achievements that get no update trigger. Added new "Recently Changed" filter, that contains all updated achievements since last addon and ui (re)load. Added validation for completed amount so that it does not exceed the max amount. On load the addon automatically uses always the "Recently Changed" filter, to minimize memory usage. Adjust the highlight position of the progressbar. Add info to the need parts in the tooltip, if a achievement have a ckecklist. Progressbar only gloom if progression count > 0. List is little more compact. Shows all achievements to track progression. Save window size and position. Also remember if completed task should be shown or not. Filter for zone is possible. You mean that you need many clicks to open the drop down or that a selection will used as filter? I know that you need to click in that area under the button to open the list, the button self is not working as drop down opener. I am having an issue with clicking the dropdown. I have to click it 6+ times for it too finally work? IS this a bug or Working as intended?